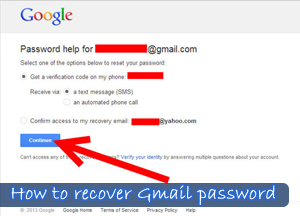 How to recover Gmail password? Worried! Get it recovered in 5 easy-to-follow steps. Need technical support, contact Techvedic @ +855-859-0057 (Toll Free). Gmail with over 425 million user-base is among the most popular email clients that occupies almost 8.43 percent of the email client/service market share as per the leading Internet marketing research firm – Campaign Monitor. Being a tech support vendor, we have witnessed many complaints or requests related to forgotten Gmail password or Gmail password recovery. Here is a quick way to recover Gmail password? Type “gmail.com” in the browser address-bar, or select the Gmail app from the Google’s homepage, i.e. google.com. Find “Need Help?” under the sign-in button. Select “I don’t know my password”. If it asks for “Enter the last password you remember”, skip it and click on “I don’t know”. In case you opted for the phone option, check your phone for the recovery code. Enter that code on the password reset page, and click on “Continue”. Make sure “Answer my security question” is selected under “Choose how to get back into your account”. Type the answer to your recovery question following the question. All above means direct you to a page where you can create a new password. Enter your new password and confirm it again. Click “Continue” to make the changes effective.